You never hear people talk about their burdens anymore. I think the word has all but disappeared from our collective vocabulary. We have a whole new set of hyphenated word pairs describing the feeling, the result, and the supposed source of what we used to call burdens. We don’t have burdens, we’re just stressed-out, burned-out, or over-committed. In Africa I keep seeing examples of what I call Red Clay Wisdom. Object lessons of life abound here. Their clarity more stark against the red clay of this massive continent. Life is stripped down and raw. You could say, simplified, but there’s nothing simple about carrying every drop of water your family will use in a day, or every piece of fuel you’ll use cooking a meal. In Africa people carry burdens. There are no Graco strollers or BabyBjorn carriers. No shopping carts clutter the streets on market day, in fact, many of the shops are mobile versions carried around on the shopkeeper’s head. Here’s what I’ve learned from my African friends. If you’re a Christian that’s your faith and your close personal relationship with God. The core of your being, the center of your strength isn’t really in you. It’s in the One who cares for you and calls you His own child. Your greatest strength is the truth that God cares for you. Every burden we carry is one we’re invited to give away. . . .casting all your care (anxiety and burden) upon Him for He cares for you. Whatever is getting you down, tearing you up, or making you fall apart, lift it up in prayer. Don’t keep it in front of your eyes, get it up above your head. Let your core is support it. In the western world we carry with our arms. Who do you know besides PopEye who has biceps the same size as their thighs? That’s hard to do when the burden is out in front of your center of gravity. Carrying burdens in your arms is like carrying a recliner chair the same way you carry a baby who needs her dirty diaper changed—with arms fully outstretched!!! Lift them up above your head, up to God who cares for you. How we think about the ‘trials’ of life can make them seem worse. We need to use our heads when we feel burdened by difficulties. Trials are like the sets of reps in weight training. They build our strength and endurance. James tells us to “count it all joy” when we experience conflicts, sufferings, and troubles in life. Not exactly the usual response we have to trials. But, that’s because we aren’t using our heads. If we’d focus on the benefit, the best possible outcome, God’s intended outcome, we’d find that burdens give us hupomone. Hupomone is a Greek word sometimes translated patience. It has the idea of being able to stand up under pressure, to handle it. Can you turn adversities into opportunities? That’s what happens when we start thinking the way God thinks about burdens. Next time you feel stressed-out or burdened remember that God is working in you through every situation you interpret as bad. He’s perfecting, completing you, making you whole. 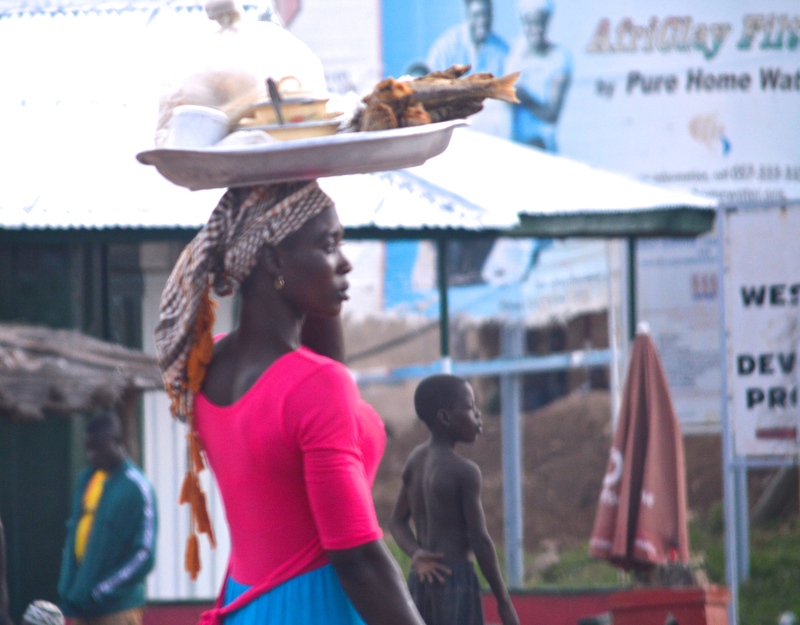 One day near a huge coastal fish market I saw a woman walking with big metal basin on her head. It was stacked high with wares she was selling. She had a baby tied on her back. As I passed by she dropped down with the grace of a ballerina, until her knees were fully bent and her bottom rested on her heels. Her back and shoulder muscles were fully sculpted and her upper torso was perfectly straight. She selected a pair of leather sandals from a display on the sidewalk and then rose up to her full height using only her strength and balance to assist her. Keeping our spiritual priorities and our earthly interests balanced is a constant challenge. The things of this life, regular things like family responsibilities, relationship problems, and career concerns can catapult ahead of God and try to push Him out of His rightful place in our hearts and minds. God understands preoccupation with those things, He gets it. The problem is that those are the things that people who don’t know God are stressed about. That’s the source of their burdens. Trying to get and gain, to grab and grasp is exhausting. It ends up in cluttered closets and empty hearts. An endless cycle of aspiration and acquisition that never results in satisfaction reaching the deep places of the heart. Knowing Him means it’s possible to maintain balance in life. O my God, I trust in You. . .
Three great tips. Thanks for helping to make sense of the day. If you get bored in the US there is plenty of need here for people with engineering and construction experience. ‘Nofacilities‘ is a perfect description for Africa! Great post and the analogy is marvelous! Have a great day!!! What an excellent post! I love the visuals and imagery you used to convey the point … a point which is extremely important for all of us as Christians to learn and apply if we want to live a burden-free life on this side of heaven. Thanks Paige. God must be saddened when His children don’t avail themselves of His wonderful and liberating truth. I was just thinking of that old, OLD hymn, What a Friend We Have in Jesus. There is no one like God. . .who rides through the heavens to help, through the skies in His majesty. I’m missing reading your posts and others from my WP friends, but we hardly ever have internet. Lord willing we’ll be back home in mid-October. What a precious reminder of who our strength really is. In recent weeks I have been reaching for the joy of the Lord. Building up my inner strength relying on the rock of my salvation sweet Jesus. Thank you for such a wonderful post. I love the comparison of African women with the strengths Jesus gives us. Prayers get me through and move the heart of God. Thank you for thinking of us and taking them time to pray Kelly. I am claiming Psalms 126. God speed Kelly. Praying for a mighty move of God for your team. They had a memorial service for my Kelly at Teen challenge of Rwanda. I was touched and honored her work will go on throughout time. As you and your teams will for the work you do. Bless you. Amen. It seems like there are some burdens weighing a ton going around. So many people need prayer. I agree with your steps. I especially like the line: “Whatever is getting you down, tearing you up, or making you fall apart, lift it up in prayer. Don’t keep it in front of your eyes, get it up above your head.” Definitely going to tweet that. Thanks for the blessing. Hey Shana, How can I find you on Twitter? I love blogging, but Twitter is a new favorite. I find some really creative things there, but it’s taking a lot of time to find who to follow.